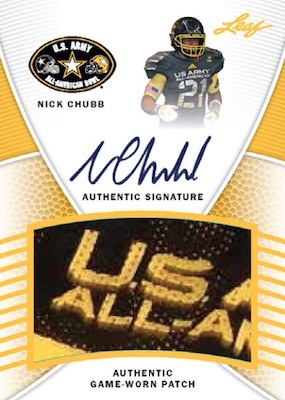 Continuing to unload the vault, 2017 Leaf All-American Football Vault doubles down on early prospect cards with one random Leaf Army box from the last several years and a bonus box of 2017 cards. 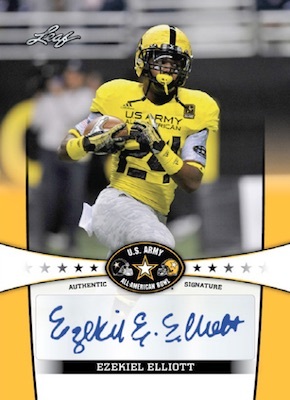 Part one of 2017 Leaf All-American Football Vault includes a sealed box from either 2010 Razor Army or 2011 to 2016 Leaf U.S. Army All-American Bowl Football. While the lineup includes boxes from any of the sets mentioned below, they are not inserted at equal rates. 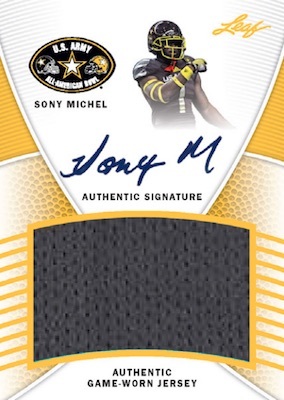 The other aspect of 2017 Leaf All-American Football Vault is the bonus box for 2017 Leaf Metal Army All-American Bowl Football. Upgraded from 2016 Vault, which had three hits, the 2017 bonus boxes pack four hits, including exclusive Metal Proof Autographs (1/1). 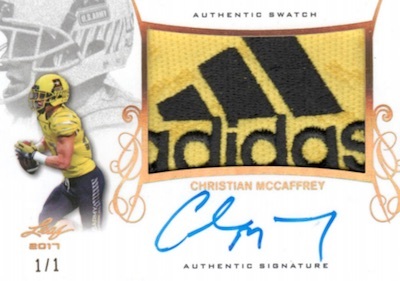 Other possible pulls come as Christian McCaffrey Patch Autographs, Freshman Class Memorabilia cards, blank back Selection Tour Autographs (#/2), Silver Metal Autographs (#/3 or less), and Printing Plate Autographs (1/1). Echoing the limited nature of the release, 2017 Leaf All-American Football has total production of 79 cases, or just 948 boxes. Najee Harris ROOKIE 2017 Leaf U.S. Army Bowl Tour Auto #D 25 Alabama PSA 10 ?